Dairy farming is one of the most common business in north rift region. Farmers have fully embraced dairy farming considering the climatical condition and the cost of food for there animals. Some farmers are not necessarily into dairy farming for milk but for calves. 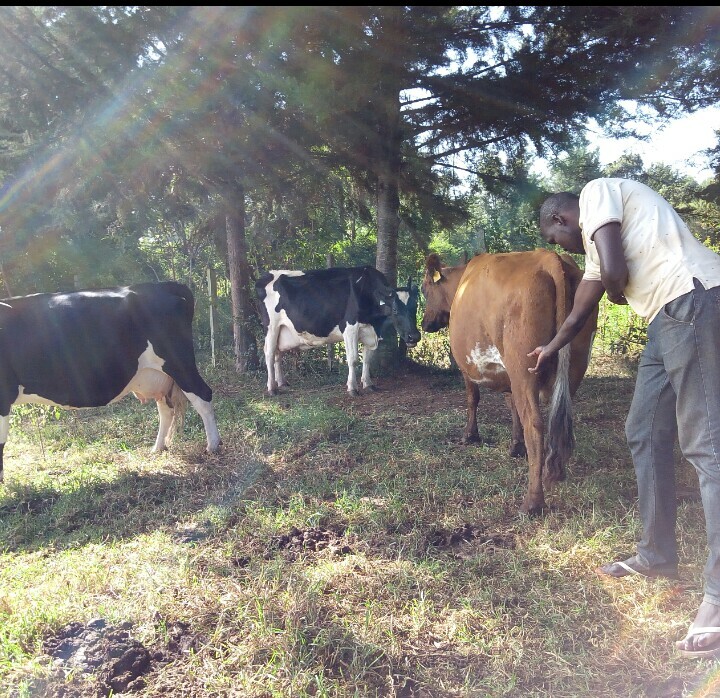 In Koitobos farm in Trans-Nzoia County Bizna Kenya talked to Silas Bundotich an IT expert who decided to venture into Dairy farm business. Bundotich has 15 exotic cows for milk. Everyday Bondotich has a total record of 200 litre of Milk that he sells locally. Bizna Kenya has learned that selling milk locally has a higher return than when selling through coprative. In a litre of milk goes at Ksh. 50 while coprates buys at Ksh. 33. While he can make such a super normal profit like Bundotich. He says on a daily ruteen he banks Ksh. 10,000 on a good day this helps him to maintain the feeding program for his dairy farm. This has been a good gesture for successful business young persons like Bundotich. But his aim in Dairy farming is to produce more calves. He says his cows usually gives birth to calves every year. “for cows to be on heat it requires proper diet which I do, like you can see hear our feeding program is very strict. I have been following every procedure as directed by vet. My cows eats well this is the reason as to why they are able to give birth every year”. Said Bundotich. Animal feeds is one of the biggest challenges to Bundotich. He recalls the cost of making a silage that he has to buy from neighboring farmers at a cost of Ksh. 40,000 per acre. His dairy requires at least 4 acres of planted maize for silage each year. This is a big challenge considering other food requirements are needed to compliment the silage. Each year Bundotich has been receiving an average of 8 calves. This is the main business for Bundotich, He says calves are sold once they get to 9 months. At this age each calves is mature and can be sustained. Banking more than Ksh. 100,000 per calve, Bundotich says that female calves are more expansive than the male one, so He has always that ensured he gets the right artificial insemination for his cows. Two years ago Bundotich had 10 calves that he sold to a farmer in Nandi county at a cost of Ksh. 1.6million. He says milk production is used to meet expenses that are required daily. He attributes his milk success to good market research. By choosing to sell his milk locally than to milk companies was one of the risks that any successful entrepreneur would choose. As he looks into the future Koitobos farm will require a milking plant that will help to preserve Bundotich milk production and neighboring farms it will also have the opportunity to do value addition to milk. This year Bundotich wants to increase his Dairy farm to at least 20. He also has plans to acquire modern equipment that will help him to maximize milk production and other functions within his dairy. All this is what Bundotich is looking forward to achieve. By doing this a lot of benefits will come along the way to residents of Hospital ward where Koitobos farm is located. Among them will be employment and growth of economy. Do you guys proof read your articles for typos and grammatical errors? !